Tokyo, May 10, 2013 - Fuji Heavy Industries Ltd. (FHI), the manufacturer of Subaru automobiles, today announced that the Subaru Legacy won the top rank "Five Star Award" for earning the maximum five star overall rating in the 2012 Japan New Car Assessment Program (JNCAP) crash safety evaluation tests conducted by the Ministry of Land, Infrastructure, Transport and Tourism (MLIT) and the National Agency for Automotive Safety and Victim’s Aid (NASVA). The Legacy received the award for the second consecutive year following its 2011 "Five Star Award". 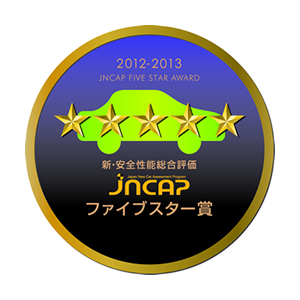 This is the second five-star rating for Subaru in 2012 JNCAP. The Subaru Impreza also won the same prize in November of 2012. Through its brand statement "Confidence in Motion", FHI is committed to offering its customers Subaru’s distinctive "Enjoyment and Peace of Mind" driving experience. Subaru will continue to enhance its active, passive and pre-crash safety technologies under the Subaru "All-Around Safety" principle as the foundation of enjoyable, heartsease driving for drivers and passengers. With the aim to encourage consumers to choose safe vehicles by raising awareness on automobile safety as well as to promote manufacturers to develop safer products, JNCAP conducts testing on models selected from among commercially available vehicles in the Japanese market and releases overall ratings based on the JNCAP crash performance tests including full-wrap / offset frontal collision tests, a side collision test and pedestrian head / leg protection tests.